What if the Pauline letters were labelled after their sender? Since we are towards the end of the semester, I am at that point in my NT intro course where we are looking at the (so-called) Catholic Epistles. It occurred to me yesterday that the genius of Paul's epistles is that they have nice memorable, catchy individual names like "Philippians" and "Galatians". There is only one sequel (2 Corinthians), possibly two (2 Thessalonians). But what if Paul's letters were were named after their sender rather than his audiences? Would Romans have worked as well if it were called 6 Paul? Or 1 Corinthians if it were 2 Paul? It's difficult to imagine, somehow. It's a bit like the Bond films. Would On Her Majesty's Secret Service have been as appealing if it were called James Bond 6? Or Die Another Day if it were James Bond 20? I doubt it. 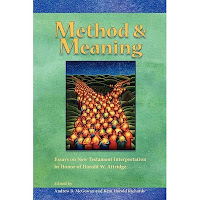 I was delighted to receive today my copy of Andrew B. McGowan & Kent H. Richards, Method and Meaning: Essays on New Testament Interpretation in Honor of Harold W. Attridge (Atlanta: Society of Biblical Literature, 2011). It's a massive volume, just under 600 pages, and aims to honour one of the great scholars of early Christianity of our time. You can read a little more about the volume over on the SBL site -- front matter including introduction and table of contents -- and there is a nice flyer there too. One of the two editors, Andrew McGowan, has been blogging about it too, with more over on academia.edu too. My essay in the volume is about the Synoptic Problem. It's called "The Synoptic Problem: John the Baptist and Jesus" and it comes just after James Robinson's contribution (and there's an honour I never expected to have). I know -- surprise, surprise! -- Goodacre is writing about the Synoptic Problem again! But in my defence, I was asked to write on the topic, and the idea of the volume is that it will not simply be one of those Festschriften that allows scholars to throw in any old piece they happen to have been working on. Rather, it looks to provide a volume that will be of use to students of the NT and early Christianity, looking at the major methods in the field and applying them to specific texts. Seriously, I am absolutely delighted to have been invited to participate in what looks to be a fantastic volume. I have already begun delving into it. There was a reception in honour of Harold Attridge at the SBL this year, at which this volume was presented, on the Friday evening, and it was very clear just how well-loved and greatly respected Harold Attridge is in the guild. My hope is that this volume will contribute in some way to honouring the wonderful contribution that he has made to enriching the study of early Christianity. I have been invited by the Student Advisory Board at the Society of Biblical Literature to speak at a session on the "Wired-in Generation". It is on Saturday at 1pm and the details of the program are at the bottom of this post. My title is "Pods, Blogs and other Time-wasters: Do Electronic Media Detract from Proper Scholarship?" Putting "pods" at the front of that title is a deliberate and self-indulgent reference to my own attempts at podcasting, something that at this point still marks out my own online output as a little different from others'. In spite of the massive proliferation of academic blogs in recent years, there are still relatively few podcasts around, thinking especially of genuine podcasts, i.e. programmes produced specially for the occasion of disseminating via the internet, and not just online recordings of lectures. Having produced the NT Pod for over two years now, I am still struck at how podcasting differs from a lot of the other stuff one does online. Somehow, perhaps because it takes so much longer to prepare, record and produce a podcast than it does to blog, it feels like it has a longevity that the blogs lack. But perhaps it is just that it is a relatively new medium. Perhaps podcasts will, in the long run, go the way of other experiments on the net and will come to be seen as "of their time", dated, forgettable, a waste of time. My title is, of course, slightly facetious given that I have "wasted" a huge amount of my own time in online activities. First, back in the mid to late 90s, it was the e-lists. I still remember the thrill of participating in the e-lists, first b-greek and Crosstalk and later also Synoptic-L and several others. The late 90s were their hey-day. Back then, the whole world was not on email and it now seems extraordinary to imagine that it was actually a thrill to receive an email. And to receive emails from all around the world and to be able to reply instantly, arguing about some element of Greek grammar, or some theme in Historical Jesus scholarship -- it was genuinely exciting stuff. I have similar memories of the early days of blogging, roughly a decade ago. When Jim Davila began his Paleojudaica blog, I read it avidly. It was the first blog I remember even being aware of. It wasn't long before I wanted to begin my own, then as a sister to the New Testament Gateway site that I had been running since the late nineties, though later under its own NT Blog heading. Back then blogging was easy, innovative and fun. With so few people blogging in our area, there were only a handful of blogs to read, and that gave one more time to write. There was a thrill in exploring the new medium, and I loved it. The email lists have not gone away, but their importance has diminished massively now that we are all desperately fighting to stay on top of the hoards of daily emails, longingly imagining that simpler world that we once inhabited with its letters, memos and time for reading. Looking back on the heyday of the e-lists, I can't help thinking that I must have wasted a huge amount of time on them. It really felt like it mattered when one was deep in debate with someone about some point of Greek grammar, or some argument for the existence of Q. But what value was it really? I am embarrassed to think of the boldness with which we circulated our half-baked opinions and relieved to think that lots of that stuff has vanished from the net, never to be seen again. But what about blogs? What about the time spent blogging? Could it have been spent more profitably doing something else instead, like reading a book, taking a walk or sleeping? I remember how people would sometimes comment on the time stamps on my posts, so often written in the early hours of the morning. I used to say that that was the only way that I could find time to blog, and I think I believed it. Why didn't I just take life a little easier? Or why didn't I write more real stuff and get more published? 3,604 posts in eight years. Hundreds of thousands of words. Hours, days, weeks of time wasted. Why did I bother? Why do any of us bother? After all, I am not the most prolific blogger, not by a long shot. How much time has been burned up by the likes of uber-bloggers like James McGrath, Jim West and Joel Watts? Back in the early days of doing scholarship on the internet, I remember being asked by another scholar about the value of this sort of work, not, at that point, blogging, but e-lists, websites and the like. I was working in the UK at the time where we had a thing called the "Research Assessment Exercise". I wouldn't be able to submit any of my internet stuff to that, would I? I was a little take aback by the question. It had never even occurred to me that the internet stuff might be taking me away from proper scholarship, the kind of stuff that one could submit to the RAE. Perhaps he was right; perhaps this is not the way for a true scholar to behave. Anyone who has had a blog for a while will be aware of just how short our memories are. When the same old question comes back around again -- there is a kind of blog cycle -- it is rare for one of us to say, "Oh, I remember a great post about that two or three years ago." Blogs are ephemeral. Blog posts do not endure. Even if you keep a full archive of everything you have ever posted, the vast majority of your posts, the great bulk of activity, 99% of your output evaporates from consciousness. Here today, gone tomorrow. I have often been surprised at what I forget of my own blogging activity. I was pleasantly surprised to find a reference in a recent article written by John Lyons, and published in the Journal for the Study of the Historical Jesus, to something I had once said here about the conflict between the criterion of multiple attestation and the criterion of embarrassment in historical Jesus research. It was a good thought, I think, but one that I had completely forgotten. But here is another thought. Perhaps I would have forgotten that idea forever if I had not blogged it. Perhaps this is one of the values of a blog -- it is the chance to put down a marker in the sand, to share some thoughts, to put things out there and to see what happens. Indeed, this is one of the values of the medium -- it is a little more than the casual conversation but a little less than the published piece. It can occupy a kind of middle ground. It is a sketch pad, but it is also interactive. If you are lucky, people talk back. A New Testament scholar once asked my advice on starting a blog in order to support his new book that was coming out, to give it a bit of extra publicity and to provide a place where people could come and interact with him about the book. I advised caution. Blogs that are set up to support publications seldom last very long, not least because they end up being rather self-possessed and narrow. The most successful blogs, or the ones that I like reading, are those that range widely, blogs that chat about topics that are outside the narrowly defined area of a particular scholar's research interest, and touch on ephemera related more broadly to the discipline. They are great for intellectual tidbits, the things you just can't resist sharing but know will never make it into one of your publications. They are places for notes about teaching, for reflections on the funny side of scholarship, for research ideas that would otherwise never see the light of day. And it's worth thinking too of those ideas that are better left to the blog alone, or would have better left even off the blog. Sometimes blogging is all you need to do to convince yourself that an idea does not have legs and can be quietly dropped. I don't think I'd advise anyone to start a blog unless there was a chance that they would be become an enthusiast. In the end, it has to be its own reward. The same is true with those other bits of public technology, podcasts, gateway sites, even the ones that now look long in the tooth, the e-lists, the scholarly websites. That's why I don't regret the time I have spent online. I have enjoyed it and it is just possible that it has made me a better scholar. It's certainly given me some practice in writing, in interacting with others, and in improving my teaching. I suppose that what I am saying to the graduate students is that it really is a waste of time to blog, to podcast, even to tweet, if you are doing it for its own sake, to gain recognition or something like that. But if it's something you'd enjoy, it does have its rewards. I sometimes think, "That's bloggable!" even if I don't get around to blogging it. Or "I could do a podcast on that!" even when I never find the time to sit down and record. And that's something that can keep you sane, which can't be a bad thing. The time has come for the SBL Annual Meeting again, when thousands of Biblical scholars all descend on some American city and hang out together for a few days, listening to good, bad and many mediocre papers, walking through the book exhibit, going to meetings, networking and, most importantly of all, socializing. This year it is in San Francisco and travelling there from the east coast is almost like travelling from England. You even have to cross several time zones. As a result, I've got a horribly early start in the morning. As usual, I'll be tweeting my way through the conference (follow me @goodacre) I've just taken an early look and it appears that the hashtag of choice is going to be #SBLAAR. I always used to blog my way through the conference too, and used to enjoy it, and I'll see if I can do the same this time. It can be a good way of staying awake in sessions, but it does depend also on not being too busy. I look forward to seeing lots of you there. As I mentioned the other day, I went to an excellent conference on "Erasure History" in Toronto last weekend. I tweeted through the event. It was a genuinely outstanding conference, organized by John Marshall, and the qualities of the papers were excellent. Tony Burke has some reflections on Apocryphicity. My own paper imagined A World Without Mark and I've made it available here (PDF) for a while, with the usual remarks about it being work in progress and subject to revision, and so on. From Antiquity to the early middle ages, lost texts may outnumber survivors. The reconstructive efforts of historiography in general and textual editing in particular must grapple with the way in which the poverty of preservation conditions scholarly efforts. "Erasure History" names the effort to think through significant historical problems as if a crucial surviving source were instead among the lost. This endeavour of programmatically holding data in abeyance is meant to illuminate the conditions under which we actually labour and to facilitate fresh consideration of, and renewed humility before, the generative problems of Western historical scholarship. The purpose of the Erasure History Workshop is to bring together students and scholars from disciplines that study the ancient Mediterranean world historically to participate in a thought experiment with methodological significance. The workshop's participants will consider the status of "the archive" of Mediterranean Antiquity by abstaining from an important source in analysis of a literary/historical problem. Several prominent scholars from North American Universities have been invited to think and write provisionally in contradiction to their specialized knowledge of a key topic in their field. The goal of the exercise is to understand better the problems under investigation by understanding better the status of the archive that is the basis for their analysis. The Erasure History Workshop will form the 47th instance of the Conference on Editorial Problems held annually at the University of Toronto. I will be speaking on "A World without Mark" and John Kloppenborg will be responding. More details, full program and registration details here. The Origin of the Symbol "Q"
An anonymous writer on the Sheffield Biblical Studies blog has a nice post on Why was ‘Q’ named ‘Q’: because ‘Q’ comes after ‘P’? in which s/he quotes R. H. Lightfoot's contention that the symbol "Q" did not originate in Germany but rather in England. J. Armitage Robinson claimed that he used it in the 1890s as the letter coming after "P" in the alphabet. For him, "P" stood for "Peter", the alleged source of Mark's Gospel.